Traffic safety applications using vehicle-to-vehicle (V2V) communication is an emerging and promising area within the intelligent transportation systems (ITS) sphere. Many of these new applications require real-time communication with high reliability, meaning that packets must be successfully delivered before a certain deadline. Applications with early deadlines are expected to require direct V2V communications, and the only standard currently supporting this is the upcoming IEEE 802.11p, included in the wireless access in vehicular environment (WAVE) stack. To meet a real-time deadline, timely and predictable access to the channel is paramount. However, the medium access method used in 802.11p, carrier sense multiple access with collision avoidance (CSMA/CA), does not guarantee channel access before a finite deadline. In this paper, we analyze the communication requirements introduced by traffic safety applications, namely, low delay, reliable, real-time communications. We show by simulation of a simple, but realistic, highway scenario, that vehicles using CSMA/CA can experience unacceptable channel access delays and, therefore, 802.11p does not support real-time communications. In addition, we present a potential remedy for this problem, namely, the use of self-organizing time division multiple access (STDMA). The real-time properties of STDMA are investigated by means of the same highway simulation scenario, with promising results. Some of the new, emerging applications for enhancing traffic safety found within the intelligent transportation systems (ITS) sphere can be classified as real-time systems, that is, the transmitted messages have deadlines. In addition, requirements on high reliability and low delay are imposed on the wireless communication systems in use. For example, it is vital that an event-driven message reaches its intended recipient(s) before a particular time instant, for example, before a traffic accident. Information that is delivered correctly, but after the deadline in a real-time communication system, is not only useless, but can also have severe consequences for the traffic safety system. This problem has been pointed out also in [1–3]. In most cases, the extremely low delays required by traffic safety applications imply the need for ad hoc network architectures, supporting direct vehicle-to-vehicle (V2V) communication in peer-to-peer mode. The IEEE 802.11p draft standard, intended for V2V ad hoc communication in high-speed vehicular environments, has received a lot of attention since its project authorization request (PAR) was approved by IEEE , which states amongst other things that multiple data exchanges should be completed within 50 milliseconds time frames. The original IEEE 802.11, intended for wireless local area networking (WLAN), has two well-known drawbacks within its medium access control (MAC) technique carrier sense multiple access (CSMA): it can cause unbounded delays before channel access as well as collisions on the channel. The MAC protocol decides who has the right to transmit next on the shared communication channel. In a carrier sense system, such as CSMA, the node first listens to the channel and if the channel has been free for a certain time period, the node transmits directly with the implication that another node can have conducted the exact same procedure, resulting in a collision on the channel. Moreover, a node can experience very long channel access delays due to the risk of the channel being busy during its listening period. These two phenomena occur primarily during high utilization periods in the network. CSMA is used by the whole IEEE 802.11 family as well as its wired counterpart IEEE 802.3 Ethernet. One of the reasons for the success of both WLAN and Ethernet is the straightforward implementation of the standard resulting in reasonably priced equipment. Due to this WLANs and Ethernet are often applied to other domains than they originally were designed for. Even though CSMA is unsuitable for real-time communication because of the unbounded channel access delays, Ethernet has paved its way into the industrial communication scene where many real-time systems are found. However, the problems with the MAC method can be solved here by introducing more network equipment, such as switches and routers, and thereby reducing the number of nodes competing for the shared channels, that is, breaking up collision domains. In the wireless domain, however, there is no such easy solution since the wireless channel has to be shared by all users. Further, when the CSMA algorithm is applied in the wireless domain, an interferer could easily jam a geographical area, intentionally or unintentionally, and the nodes in this area would defer their access even though there is no "real" data traffic present. A wireless carrier sense system is thus more susceptible to interference since no access will occur as long as activity is detected on the channel. The upcoming standard IEEE 802.11p, intended for vehicular ad hoc networks (VANET), will use CSMA as its MAC method, despite its inability to support real-time deadlines. The argument is that the problems with CSMA are most pronounced at high network loads, and traffic smoothing can be introduced to keep the data traffic at an acceptable level. However, traffic smoothing is typically used in centrally controlled networks or networks in restricted geographical areas. A VANET is neither a restricted geographical area, nor can it be made predictable by a central controller due to its highly dynamic characteristics and requirements on low delay. In addition, traffic smoothing only reduces the average delay, and the main problem with unbounded worst case delay remains. A remedy to the problem with potentially unbounded channel access delays when using CSMA could be to use a self-organizing time division multiple access (STDMA), a decentralized, yet predictable, MAC method with a finite channel access delay, making it suitable for real-time ad hoc vehicular networks. An STDMA algorithm is already in commercial use in a system called automatic identification system (AIS), where it focuses on collision avoidance between ships. This paper analyzes the particular communication requirements introduced by traffic safety applications, namely, low-delay, reliable, real-time communications. The requirement on low delay implies the need for an ad hoc V2V network, whereas the reliability constraint poses high demands on the physical layer in terms of adaptive channel coding and modulation. The ad hoc network together with the real-time constraints requires a decentralized predictable MAC method capable of meeting real-time deadlines. We compare two MAC methods: CSMA of 802.11p and STDMA of AIS in terms of channel access delays by means of simulating a highway scenario. We have selected a data traffic scenario that is typically found in traffic safety applications: time-triggered periodic position messages having deadlines such that they expire when the next updated message arrives. The predictability in terms of channel access delays and the distance to concurrent transmitters are evaluated from the perspective of the sending node. Related research is presented next in this paper in Section 2, followed by an introduction to real-time communication systems in Section 3 and the importance of the MAC method in Section 4. The paper continues with a performance comparison of CSMA and STDMA for real-time V2V communications by means of computer simulations in Section 5, followed by our conclusions in Section 6. The MAC schemes in the literature that are targeting VANETs can be divided into two classes: CSMA-based and TDMA-based. The CSMA-based protocols considered, for example, in [5, 6] are enhanced by providing different priority levels allowing packets with higher priorities to have shorter listening period before a channel access attempt is made. However, the channel may still be busy and when it is, a transmitter with higher priority traffic will randomize a shorter backoff time than transmitters with lower priority traffic. This type of prioritization mechanism where the delay before channel access together with the backoff time is manipulated according to packet priorities is also found in the standard IEEE 802.11e which is included in IEEE 802.11p. In , there is also an additional feature where a potential transmitter sends a busy tone using a reserved frequency to get the attention from the intended recipient, which then polls the busy tone sender. However, busy tones and prioritizing packets do not eliminate the problem and there is still no upper bound on when channel access can take place. The TDMA-based protocols in [7–10] use time slots to achieve collision-free transmissions of data. The difference between these protocols lies in how they assign their time slots. In ‎[7, 8], space division multiplexing (SDM) is used, where the road is first divided into spaces, and within each space a TDMA scheme is mapped. Each vehicle will use different time slots depending on where it is currently situated. This approach is promising but likely to be impractical in a real system. The overall network utilization will be low since many time slots are unused when the vehicle traffic is sparse. The authors of ‎[7, 8] do propose algorithms for increasing the time slot usage, but other problems remain. For example, a spatial division of each road needs to be set up, possibly offline. In ‎, the 3G radio interface UMTS terrestrial radio access time division duplex (UTRA TDD) is used as physical layer (PHY), and at the MAC level, the available time is also divided into slots. To achieve a transmission opportunity in the TDMA frame in [9, 10], a random access channel (i.e., CSMA) is deployed. The request for time slots during high utilization periods on a contention-based random access channel will face the same problem as in [5, 6]‎. Another drawback with almost all of the above MAC protocols [5, 6, 9, 10] proposed for the vehicular environment is that they do not incorporate the dynamics of the network and, therefore, they are still only applicable to slow moving objects and ordinary ad hoc networks. The physical layer (PHY) of the upcoming IEEE 802.11p and its capabilities has been treated in a series of articles [11–13]. The investigation of the PHY is very important to increase the transmission reliability, but still if no channel access is possible, we will never use the PHY facilities. Enhancements to the MAC layer of 802.11p have been suggested and evaluated in [14–16], which all have in common that they want to decrease the data traffic load by, for example, prioritizing better. An attempt to avoid packet collisions by using a polling scheme is suggested in ‎. However, none of these articles clearly points out the MAC layer to be the weak part of 802.11p in order to support emerging traffic safety systems with low-delay real-time requirements. The direct communication enabled by the ad hoc mode and the prioritization does decrease the average delay, but the worst case collision scenario is still the same. In , a reliability analysis of the 802.11p is made from an application and a communication point of view. No enhancements are suggested, but the 802.11p together with real-world application data traffic was evaluated and found to provide sufficient reliability. However, the real-world data was collected when three vehicles in a highway scenario were communicating, which has to be regarded as a very lightly loaded system. In such a scenario with few competing nodes, almost any type of MAC method will function satisfactory. A more realistic setting with more communicating nodes is likely to stress the MAC method further. An analytical performance evaluation of 802.11p together with simulations is presented in ‎. It is concluded that 802.11p cannot ensure time-critical message dissemination and that the solution ought to be a reduction in the number of high priority messages. Real-time communication implies that the communication task has demands on timely delivery, that is, messages should reach their intended recipients before a certain deadline in time and with a certain reliability (error probability). Communicating real-time messages does not necessarily require a high transmission rate or a low delay, but it does require a predictable behavior such that the message is delivered before the deadline with the requested error probability. Therefore, real-time communication tasks are characterized by two important parameters: deadline and reliability ‎. Depending on the application, a missed deadline could potentially have severe consequences for the system user or simply lead to temporarily performance degradation. Emerging traffic safety systems based on vehicular communication are real-time systems in accordance with the above classification. Examples of real-time deadlines within traffic safety applications are lane-change warnings, rear-end collision warnings, and conveying slippery road conditions, all of which include messages which must reach the intended recipients before the event takes place. A Voice over IP (VoIP) conversation over the Internet is an example of a real-time system that has data packets with deadlines since it is better to drop VoIP packets that are late than to introduce longer and longer delays. The antilock braking system (ABS) in a vehicle is another example of a real-time system; but contrary to the VoIP application, the requirement on error probability is significantly higher in this control application and also packets delivered shortly after the deadline could be used with diminishing returns. Consequently, applications have different requirements on the values of the parameters deadline and reliability, for example, a VoIP conversation can tolerate packet losses, implying relaxed constraints on reliability, but puts stringent demands on keeping the deadlines and in the ABS case it is almost the other way around. Vehicle safety systems, communicating to avoid or mitigate traffic accidents, are real-time systems where it is equally important that the packet loss rate is close to zero (high reliability) as it is to keep the deadlines. One way to improve the ability of the real-time communication system to meet deadlines is to prioritize the data traffic to provide classes of different importances, but obviously if all nodes in the network have traffic from the same priority class to transmit this will not have any effect. Real-time communication systems are a mature research area within, for example, wired industrial networks and there exists a plethora of standards intended for real-time communication in industrial environments, for example, fieldbuses  ‎ or control networks , often with its own manufacturer. Since the industrial communication society has not agreed upon one common network technology, the local area network (LAN) standard Ethernet has won terrain due to its affordable equipment and the literature about the use of Ethernet in industrial environments is vast, for example, [21–23]. An attempt to make Ethernet predictable and more suitable for real-time traffic is RETHER , where a token ring-based protocol is used on top of the normal CSMA protocol. Despite the MAC method being CSMA, Ethernet can be used in industrial real-time applications due to the following reasons: (i) an industrial network is a controlled environment where the number of network members is known in advance, (ii) the controlled environment also implies that the data traffic including priorities is known or can be determined in the worst case, and (iii) the communication takes place via a wire implying significantly lower bit error rates than for wireless communication. These three things help the designer to either keep the network load low such that we are not operating close to what the network can handle or to introduce real-time enhancements to CSMA possible in stationary networks, such as token ring. One of the most important parts of a real-time communication system is the MAC method. In this paper, we are investigating the ability of a sending node to get access to the channel within a finite upper bound. Therefore, we define the MAC channel access delay as the time it takes from when a packet arrives to the MAC from the layer above it, until the packet is delivered to the PHY layer for transmission. For brevity, we also denote the MAC channel access delay by . An MAC method is defined to be deterministic if the worst case MAC channel access delay is finite. A nondeterministic MAC method (i.e., an MAC method for which is not finite) is unsuitable for real-time data traffic having deadlines. The set of deterministic MAC methods includes master-slave schemes, token passing schemes, TDMA, frequency division multiple access (FDMA), and code division multiple access (CDMA). These methods are well suited for real-time data traffic but they typically require a central coordinator that can distribute channel resources among the users (i.e., allot time slots/frequency bands/spreading codes). CSMA, on the other hand, is easily deployed in decentralized, ad hoc networks but is also nondeterministic. VANET is a special case of ad hoc networks and is characterized by the fact that the nodes constituting the VANET are highly mobile and can reach very high speeds. This mobility has a great impact on the choice of MAC scheme, since it must be designed to cope with rapid changes in the network topology, where communication links constantly form and break. The problem with VANETs is threefold; (i) it is hard to foresee the number of members of the network, (ii) it is hard to predict the amount of data traffic generated by the nodes, that is, the aggregated bandwidth, and (iii) the wireless channel is stochastic and time-varying in its nature and influenced by many parameters. In a static wireless ad hoc network, (i) and (ii) could be controlled but (iii) remains a challenge. Coding and diversity schemes play a vital role to increase the data reliability and mitigate the effects of fading and interference of the channel, but before these techniques can be applied, a transmission must take place, that is, the node must get access to the channel. In this paper, we analyze the real-time properties of two MAC methods: CSMA of 802.11p and STDMA of AIS. Since CSMA is nondeterministic, we are interested in knowing how it is affected by the network load, that is, how many deadlines are missed when the network load increases? STDMA, on the other hand, being deterministic, we are interested in knowing any potential drawbacks such as increased interference. This section describes the functionality of the two MAC methods. Wireless access in vehicular environment (WAVE) is the protocol stack concept for the vehicular environment developed by IEEE. It contains an MAC and PHY layer derived from IEEE 802.11 , a new transport/network layer protocol (IEEE 1609.3), security issues specified in 1609.2, and an application protocol called 1609.1. The MAC method of the upcoming standard IEEE 802.11p is a CSMA/CA derived from the 802.11, and 802.11p will also use the quality-of-service (QoS) amendment 802.11e, Figure 1. The PHY layer of 802.11p is the 802.11a, based on orthogonal frequency division multiplexing (OFDM), with some minor changes to fit the high-speed vehicular environment. The 802.11p together with the 1609.4 standard is designed for 10 MHz wide channels instead of 20 MHz as it is in the original 802.11a. Due to this, the transfer rates will be halved in 802.11p compared to 802.11a, implying transfer rates of 3, 4.5, 6, 9, 12, 18, 24, and 27 Mbps. The different transfer rates are obtained through changing modulation scheme and channel code rate. Another big difference in the 802.11p compared to the original 802.11 is that there is no difference between the nodes in the network, that is, all nodes are peers including the roadside units. There exists no access point functionality in 802.11p even though the vehicular network will contain roadside units at certain spots. An overview of the WLAN family 802. 11, showing in bold which parts that 802.11p will use and modify. IEEE 802.11p will use enhanced distributed channel access (EDCA) from the QoS amendment IEEE 802.11e ‎ as MAC method, which is an enhanced version of the basic distributed coordination function (DCF) found in 802.11. The DCF is based on CSMA/CA, meaning that the station starts by listening to the channel, and if it is free for a time period called an arbitration interframe space (AIFS), the sender can start transmitting directly. If the channel is busy or becomes occupied during the AIFS, the station must perform a backoff, that is, the node has to defer its access according to a randomized time period. In 802.11p, QoS is obtained by putting the data traffic within each node into four different priority queues. These queues have different AIFS and backoff parameters, that is, the higher priority, the shorter AIFS. The backoff procedure in 802.11 works as follows: (i) draw an integer from a uniform distribution , where CW refers to the current contention window, (ii) multiply this integer with the slot time derived from the PHY layer in use, and set this as the backoff value, (iii) decrease the backoff value only when the channel is free, (iv) upon reaching a backoff value of 0, send immediately. The MAC protocol of 802.11 is a stop-and-wait protocol and the sender will wait for an acknowledgment (ACK). If no ACK is received by the sender for some reason (that the transmitted packet never reached the recipient, the packet was incorrect at reception, or the ACK never reached the sender), a backoff procedure must also be invoked. For every attempt to send a specific packet, the size of the contention window, CW, will be doubled from its initial value ( ) until it reaches a maximum value ( ). This is done since during high utilization periods, it is convenient to distribute the nodes that want to send over a longer time period. After a successful transmission or when the packet had to be thrown away because the maximum number of channel access attempts was reached, the contention window will be set to its initial value again. In Table 1, default parameter settings for the different queues in 802.11p are found together with the CW setting. In a broadcast situation, the receiving nodes will not send ACKs. Therefore, a sender never knows if anyone has received the transmitted packet correctly or not. Due to this, the sender will perform at most one backoff, which occurs when the initial channel access attempt senses a busy channel. Hence, broadcast packets will never experience multiple backoffs, and the contention window will always be . In Figure 2(a), a flow diagram presents the CSMA procedure in the broadcast situation with periodic traffic. Default parameter settings in 802.11p for the different queues. The two MAC procedures examined in this paper using a data traffic model with broadcasted time-driven messages at predetermined heartbeat rates, (a) the CSMA procedure according to 802. 11p and (b) continuous operation phase of STDMA. The STDMA algorithm presented herein is found in a standard for the shipping industry, automatic identification system (AIS) ‎. There are international regulations saying that ships larger than 300 gross ton must use AIS, which is a transponder technique. Every ship will transmit messages containing information about its position, heading, and so on, at a predetermined heartbeat rate. The AIS system is used for identifying ships in the vicinity and it is of great help in, for example, bad weather situation since false radar images are a problem. With AIS, the ship will build its own surveillance picture about the neighborhood using the messages received from other ships. Ships all over the world can meet and track each other through this system. AIS divides the time into one minute frames where each frame contains 2250 time slots and a transfer rate of 9.6 kbps is supported. Two different frequency channels, 161 MHz and 162 MHz, are used for communication and the ships will divide its messages between these two channels (called channel A and channel B). A message is 256 bits long and it fits into one time slot. STDMA  ‎ is a decentralized scheme where the network members themselves are responsible for sharing the communication channel and due to the decentralized network topology, the synchronization among the nodes is done through a global navigation satellite system such as GPS or Galileo. The algorithm is dependent on that all nodes in the network regularly send messages containing information about their own position. The STDMA algorithm will use this position information when choosing slots in the frame. All network members start by determining a report rate, that is, deciding the number of position messages that will be sent during one frame and this translates into the number of slots required in ditto. When a node is turned on, four different phases will follow: initialization, network entry, first frame, and continuous operation. During the initialization, the node will listen for the channel activity during one frame to determine the slot assignments, that is, listen to the position messages sent in each slot. In the network entry phase, the station determines its own slots to use for transmission of position messages within each frame according to the following rules: (i) calculate a nominal increment, NI, by dividing the number of time slots with the report rate, (ii) randomly select a nominal start slot (NSS) drawn from the current slot up to the NI, (iii) determine a selection interval (SI) of slots as 20% of the NI and put this around the NSS according to Figure 3, (iv) now the first actual transmission slot is determined by picking a slot randomly within SI that is not currently occupied by someone else and this will be the nominal transmission slot (NTS). If all slots within the SI are occupied, the slot used by a station located furthest away from oneself will be chosen. Upon reaching the first chosen NTS, the station will enter the first frame phase where the rest of the report rate decided transmission slots (NTSs) are determined (e.g., a report rate of 10 messages/frame implies 10 NTSs). An NI is added to the NSS and a new SI area is made available to choose a slot from. This is repeated until a frame has elapsed and all position messages are assigned a transmission slot, Figure 3. Every node has only one NSS and this is used to keep track of when the frame starts for this particular node, that is, all nodes keep track of its own frame and they look at it as a ring buffer with no start and no end. Modulo operations are used to avoid static numbering of slots. The parameters NSS, NS, SI, and NI are kept constant as long as the node is up running. However, if the report rate is changed during operation (increased or decreased number of position messages in the frame for some reason) then the parameters will be changed since NI is dependent on the report rate. The frame structure for one node. The NSS and NSs are equally spaced with an interval of size NI. The SI parameter is also fixed. When all slots within one frame duration are selected, the station will enter the continuous operation phase, using the NTSs decided during the first frame phase for transmission. During the first frame phase, the node will draw a random integer for each NTS. After the NTS has been used for the n frames, a new NTS will be allocated in the same SI as the original NTS. This procedure of changing slots after a certain number of frames is done to cater for network changes, that is, two nodes that use the same NTS which were not in radio range of each other when the NTS was chosen could now have come closer and will then interfere if the NTS allocation was not changed. In Figure 2(b), the continuous operation phase of STDMA is depicted. The aim of this simulator is to analyze the real-time properties of the MAC protocols described in Section 4 and especially their behavior in a typical highway scenario, Figure 4. Due to the real-time properties of the system, the interesting issue here is how the two MAC methods will influence the capability of each sending node to timely deliver data packets, that is, meeting real-time deadlines. Note that we are dealing with an uncontrolled network since the number of network nodes cannot be determined in advance as we are considering vehicles controlled by humans. On the highway, the highest relative speeds are found and this causes the network topology to change often and more rapidly. If a traffic accident occurs, many vehicles could quickly be gathered in a small geographic area implying troubles with access to the shared wireless communication channel for individual nodes. As we are studying the MAC channel access delay for time-driven position messages, we are not considering the reception of messages at the nodes at this time. A promising emerging application within ITS is a cooperative awareness system such as the AIS for the ships, where the vehicles will exchange position messages with each other to build up a map of its surrounding and use this for different traffic safety and efficiency applications. In the European project SAFESPOT , applications that are built on this kind of message exchange are developed. Routing in highly mobile networks is also dependent on positions (i.e., geographical routing) rather than specific addresses when trying to find ways through the network. Therefore, time-driven position messages are likely to be of uttermost importance in future vehicular networks. Consequently, we have chosen to use broadcasted, time-driven position messages (the so-called heartbeat messages) as the data traffic model in the simulator. All vehicles broadcast data packets at two different heartbeat rates, 5 Hz and 10 Hz. There is no other data traffic in addition to the heartbeat messages. The highway is 10 000 meter long and contains 5 lanes in each direction, Figure 4. The vehicles are entering each lane of the highway according to the Poisson process with a mean interarrival time of 3 seconds (the 3 seconds are chosen in accordance with the Swedish 3-second rule, where vehicles should maintain a 3-second space to the vehicle in front). The speed of each vehicle is modeled as a Gaussian random variable with different mean values for each lane, 23 m/s (~83 km/h), 30 m/s (~108 km/h), and 37 m/s (~133 km/h), and a standard deviation of 1 m/s. The different speeds are chosen with the speed regulations of Sweden in mind. The vehicles will have the same speed as long as they are staying on the highway and the vehicles do not overtake. The purpose of this simplistic mobility model is to achieve a realistic density of vehicles on the highway to test the communication system. It is of limited interest to use a more advanced mobility model since we are not studying applications such as lane change warning or merge assistance here. Moreover, there is no universally prevailing mobility model, and the required level of accuracy for the mobility of vehicular networks is not yet clear . The channel model is a simple circular sensing range model, Figure 4, in which every node within the sensing area receives the message perfectly (i.e., without errors). Note that nodes could be exposed to two concurrent transmissions, Figure 4, where transmitters and are sending at the same time since the transmitters cannot hear each other: The receivers , , and in Figure 4 will then experience collisions of the two ongoing transmissions, unless some sort of power control or multiuser detection is used. However, since the focus of this simulation is to characterize the MAC channel access delay, , problems such as exposed and hidden terminals are not addressed here. As soon as the nodes enter the highway, they will start to transmit after an initial random delay of between 0 and 100 milliseconds. The simulation has been carried out with three different packet lengths: , and 500 bytes and two different sensing ranges: 500 and 1000 meters. The sensing range of 1000 meters was chosen because the PAR of 802.11p states that communication ranges of up to 1000 meters must be supported and the different packet lengths are chosen because of the security issues. It is very important that heartbeat messages can be trusted since many traffic safety applications will be depending on these. One way to handle the security issue is to use a digital signature being approximately 125 bytes  and in worst case this signature must be included in every packet. Therefore, 500 byte packets should be the worst case length of heartbeat packets including a signature of 125 bytes, together with the header, trailer, and position data. In our CSMA simulations, all vehicles use the MAC method of 802.11p as described above, and hence each vehicle must listen before sending and backoff if the channel is busy or becomes busy during the AIFS. As explained in Section 4.1, a broadcast packet will experience at most one backoff procedure due to the lack of ACKs in a broadcast system. The contention window will never be doubled since at most one failed channel access attempt can occur. In Table 2, parameters used in the simulation of 802.11p are listed. Since all data traffic in our simulation scenario has the same priority, only the highest priority AIFS and have been used (Tables 1 and 2) and therefore all transmitters will have the same value (34 microseconds). The backoff time is the product of the slot time, , and a random integer uniformly distributed in the interval implying four possible backoff times, : 0, 9, 18, and 27 microseconds, respectively. In Figure 2(a), a flow diagram presents the CSMA procedure in the broadcast situation with periodic position messages from every node. The "Next packet arrived?" box tests if the new position message has arrived from the layer above the MAC layer, in which case the old packet awaiting channel access is outdated and will be dropped. 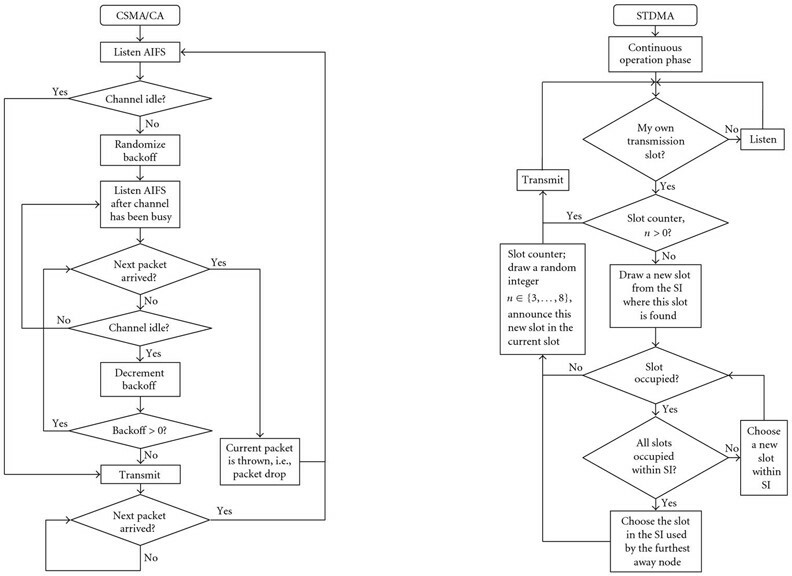 Simulation parameters settings for CSMA and STDMA. The STDMA algorithm found in AIS cannot be used right away since the dynamics of a vehicular network and a shipping network are quite different. Further, the AIS system is using lower frequencies for transmission to reach further away and the ships need to know much further ahead about ships in the vicinity to take the right decisions early on. There is a natural inertia inherent in a shipping system that is not present in the vehicular environment, that is, braking a truck and turning a ship in an emergency situation are two very different tasks. For the most part, we have much shorter time frames to work with in the vehicular environment. Both MAC protocols used in the simulation are assumed to use the same physical layer from 802.11p. The frame duration, in our simulated STDMA scheme has been set to 1 second and the number of slots is changed inside the frame to cater for different packet lengths. A transfer rate, of 3 Mbps has been used and this rate is available with the PHY layer of 802.11p, which has support for eight transfer rates in total where 3 Mbps is the lowest. This choice is made since the system under consideration requires high reliability rather than high throughput, and the lowest transfer rate has the most robust modulation and coding scheme. In the STDMA simulations, the vehicles will go through three phases: initialization, network entry, and first frame, before it ends up in the continuous operation. The phases are described in Section 4.2, and in Figure 2(b) the continuous operation phase is depicted. The vehicle stays in the continuous phase after it has been through the other three. STDMA always guarantees channel access even when all slots are occupied within an SI, in which case a slot belonging to the node located furthest away will be selected. In Table 3, the different timing parameters are shown for different packet lengths. The transmission times for CSMA and STDMA, respectively, together with packet sizes and number of slots per frame in STDMA. We assume that all vehicles in the system are perfectly synchronized with each other in both MAC scenarios and that in the STDMA case they are also aware of when the frame starts and how many time slots it contains. The simulated highway scenario described earlier has a vehicle density of approximately one vehicle every 100 meters in each lane. The vehicle density is chosen to examine the scaling performance of the two MAC layers considered in this paper. The vehicular environment is uncontrolled in terms of node density and the scalability issue, hence plays an important role when designing an MAC protocol for VANETs. Computer simulations have been carried out in MATLAB with the parameter settings in Tables 2 and 3, yielding 12 different scenarios (all combinations of three packet lengths, two sensing ranges, and two heartbeat frequencies). The most demanding case is, of course, when 500 bytes long packets are sent 10 times per second and the nodes have a sensing range of 1000 meters, since this corresponds to the largest aggregated bandwidth requirements per unit area. In this situation, an ideal MAC method (that schedules all transmissions perfectly) can handle 70 nodes that are in radio range of each other without packet collisions. However, the simulation contains situations that are overloaded and a node has around 210 neighbors within radio range when the range is 1000 meters, and consequently, we have to accept some packet drops by the transmitter or packet collisions in the air (that might also lead to packet drops at the receiver side). A packet drop at the transmitter occurs when a new position message has arrived from the layer above the MAC layer, before the old packet awaiting channel access has been transmitted. Cumulative distribution functions (CDFs) for the channel access delay, that is, for CSMA are shown in Figures 5(a) and 5(b) for two different sensing ranges, respectively. To avoid edge effects in the simulation, statistics were only collected from the middle part of the highway and only when the highway is filled with vehicle traffic. Dropped packets are considered to have infinite channel access delays, and the CDFs will, therefore, not reach unity at a finite delay. We can interpret where is the heartbeat frequency, as the packet drop probability or, equivalently, as the missed deadline ratio (since is the deadline). The three plots in each figure represents the CDF for the node performance in the best, worst, average cases. For a sensing range of 500 meters, approximately 100 nodes are within radio range and packet drops are unavoidable. The best case node will drop 5% of its generated packets and the worst case node will drop 65% of its packets. When the sensing range is extended to 1000 meters in Figure 5(b), the situation becomes untenable and, on average, nodes will drop around 50% of their packets. Cumulative distribution function of channel access delay, in a highway scenario with 10 lanes, 500 byte packets, 10 Hz heartbeat. (a) Sensing range of 500 meters and (b) sensing range of 1000 meters. The average missed deadline ratios, average over all vehicles and all messages, for all simulated scenarios using CSMA are shown in Table 4. Hence, for a sensing range of 1000 meters and a heartbeat frequency of 10 Hz, only 47% of the packets are transmitted. Probability of packets drop averaged over nodes in a network using CSMA. The distribution of packet errors over time for a certain node is also of interest. Clearly, it is undesirable to lose many consecutive packets since this will make the node invisible to the surrounding vehicles for a period of time. 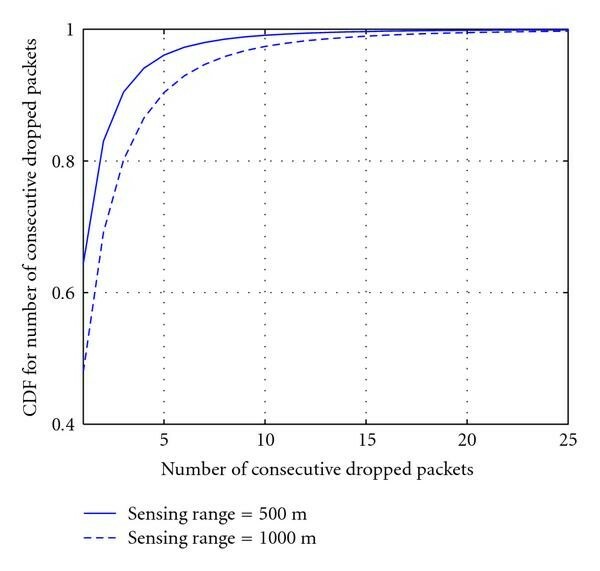 The CDF for the number of consecutive packet drops is shown in Figure 6 for two different sensing ranges. In the worst case, a node experienced over 100 consecutive packet drops, implying invisibility for over 10 seconds. However, in more than 90% of the cases, fewer than 5 consecutive packets were dropped. Number of consecutive dropped packets due to no channel access. The STDMA algorithm always grants packets channel access since slots are reused if all slots are currently occupied within the selection interval of a node. When a node is forced to reuse a slot, it will choose the slot that is used by a node located furthest away. Hence, there will be no packet drops at the sending side when using STDMA and the channel access delay is always bounded and relatively small. In Figure 7, the CDF for the channel access delay for STDMA is depicted and as can be seen, all nodes will choose a slot for transmission during their selection interval. Therefore, the CDF for in STDMA is ending at unity after a finite delay as compared to the CDF for in CSMA according to Figures 5(a) and 5(b). The CDF for channel access delay when using STDMA. This finite upper bound on in STDMA does, however, come at the expense of increased interference on the channel (i.e., more packet collisions in the air will occur) as compared with CSMA. The intentional slot reuse probability is a parameter that can be used to indicate the interference level and thereby the reception performance of an STDMA system. In Table 5, the intentional slot reuse probability is tabulated for the different data traffic settings. The worst case is found when the nodes are transmitting 500 bytes long packets having a heartbeat of 10 Hz and a sensing range of 1000 meters, and then 50% of the slots are intentionally reused. The intentional reuse of slots within sensing range for different data traffic scenarios in the STDMA case. In Figure 8(a), the CDF for the minimum distance between nodes intentionally utilizing the same slot within sensing range is depicted for different packet lengths. With a smaller packet size, more nodes can be handled by the network since smaller packets imply that every node keeps the channel occupied during a shorter time period. When long packets are used, the distance between two nodes intentionally reusing the same slot is reduced. In the CSMA/CA case, all channel requests did not make it to a channel access and then the nodes started to drop packets. However, in the CSMA/CA case when a node gets a channel access, there is always a risk that someone else sends at the same time, that is, a collision in the air. This is due to the fact that nodes can experience the channel idle at the same time, either because the channel actually is idle or because ongoing transmissions are not detected (see Figure 2). In Figure 8(b), the CDF for the minimum distance between two nodes in the CSMA/CA scenario sending at the same time for three different packet lengths is depicted. The minimum distance can be interpreted as the distance between the nodes whose packets will, on the average, interfere the most with each other. In the 500 bytes, 1000 meters sensing range scenario, about 47% of the channel requests were granted (see Table 4), and, from Figure 8(b), we conclude that the transmitted packets will be interfered by another transmission within 500 meters in approximately 53% of the cases. 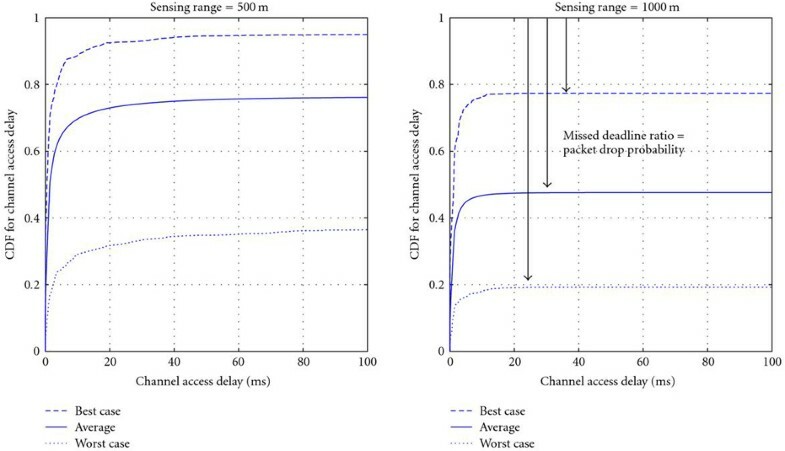 The CDF of the minimum distance between two nodes (a) utilizing the same time slot in STDMA and (b) sending at the same time in CSMA/CA, using 500 byte packets, heartbeat of 10 Hz, sensing range of 1000 m.
The new emerging cooperative traffic safety systems can be classified as real-time communication systems, and they are characterized by two important parameters: deadline and reliability (error probability). At the PHY layer, the reliability could be increased by using tailored channel coding and diversity techniques to overcome the impairments of the wireless channel, but first and foremost a timely channel access must be granted. Otherwise, the PHY layer techniques are irrelevant. To meet real-time deadlines, the MAC scheme must be predictable so that it can provide some sort of finite channel access delay, , to guarantee that communication tasks meet their deadlines, that is, the MAC scheme must be deterministic ( is finite). The upcoming standard IEEE 802.11p intended for VANET used for safety traffic applications with real-time communication demands will use CSMA as its MAC method despite its two well-known drawbacks: unbounded channel access delays as well as collisions on the wireless channel. When the node density increases, CSMA has huge troubles with solving all channel access requests into channel access. We have proposed to use STDMA as a remedy to the CSMA scaling problems. STDMA is a decentralized, predictable MAC method with a finite channel access delay, making it suitable for real-time ad hoc vehicular networks. An STDMA algorithm is already in commercial use in a system called automatic identification system (AIS) where it focuses on collision avoidance between ships. We have analyzed the particular communication requirements introduced by traffic safety applications, namely, low-delay, reliable, real-time communications. The requirement on low delay favors the use of an ad hoc V2V network, whereas the reliability constraint poses high demands on the physical layer in terms of adaptive channel coding and modulation. The ad hoc network together with the real-time constraints requires a decentralized predictable MAC method capable of meeting real-time deadlines. We have, therefore, compared the real-time properties of two decentralized MAC methods, CSMA of 802.11p and STDMA of AIS, in terms of channel access delays and interference (due to packet collisions in the air), by simulating a highway scenario with periodic broadcast traffic, where the packets contain information about the sending node, such as position and speed. The deadline in this case is simply the time between consecutive packets. As an example, the results revealed that on a 10-lane highway where nodes send 500 bytes long packets every 100 milliseconds and the sensing range is 1000 meters, a node with the CSMA MAC layer can drop up to 80% of the packets in the worst case (i.e., channel access was not granted during the 100 milliseconds between two consecutive packets). Moreover, in this scenario, a vehicle can experience up to 100 consecutive heartbeat packet drops, implying that the vehicle will become invisible to the surrounding nodes during as long as 10 seconds. The STDMA algorithm, on the other hand, always grants packets channel access since slots are reused if all slots are currently occupied within the selection interval of a node. When a node is forced to reuse a slot, it will choose the slot that is used by a node located further away. Hence, there will be no packet drops at the sending side when using STDMA and the channel access delay is always bounded and relatively small. Packet collisions in the air will occur in both CSMA (unintentionally) and STDMA networks (intentionally and unintentionally). We have shown that small distances between the closest interfering nodes are more probable for CSMA compared to STDMA, indicating, somewhat counterintuitively, that the packet collision problem is actually worse in CSMA compared to STDMA. This work was funded in part by the Knowledge Foundation, http://www.kks.se/.